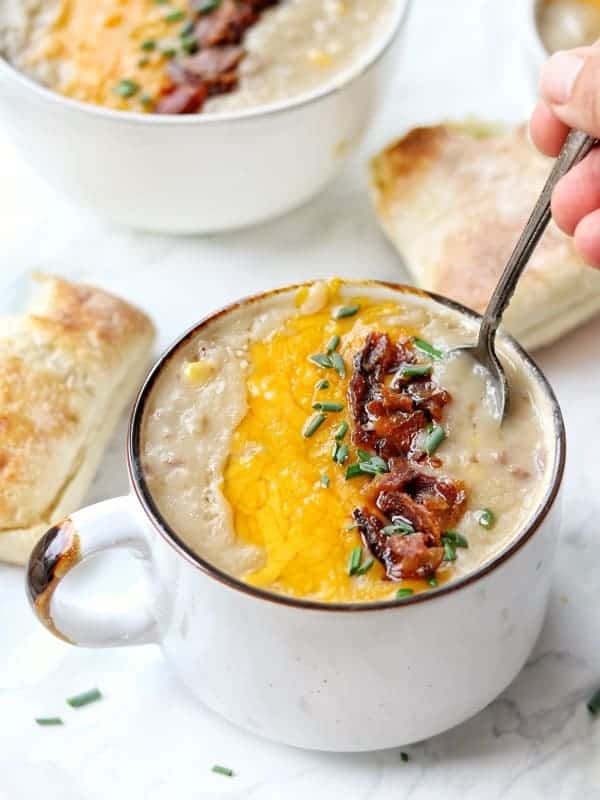 A creamy, flavor-packed easy crockpot potato soup that’s simple to make without heavy cream. This is a healthy, cheap crockpot meal that’s great for those on a budget. 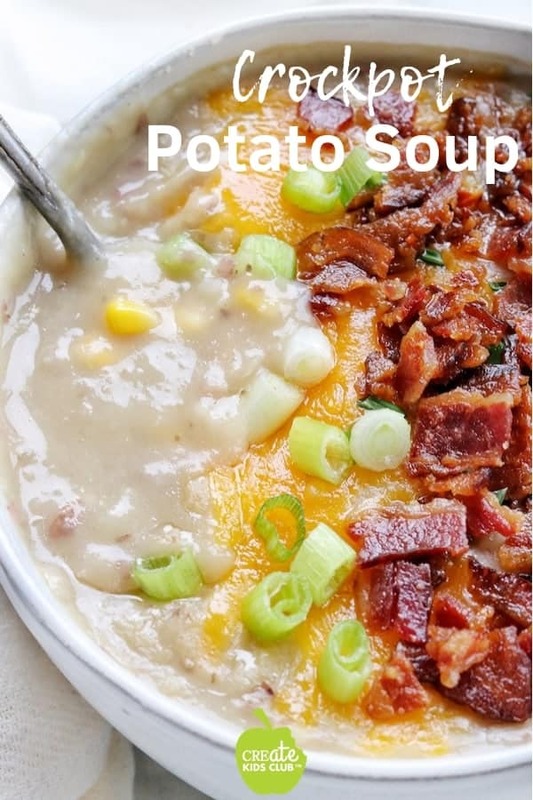 Delicious and healthy yet cheap crockpot meals like this potato soup are family favorites. This potato soup not only cuts fat and calories of a traditional potato soup, but it also comes in well under $3.00 per serving. The best part about this recipe, besides the flavor, is that it takes very little time to prepare. Which Potato To Use For Potato Soup? There are many varieties of potatoes and each has a different starch content and skin thickness. They also react to heat differently. Starchy varieties do not keep their shape very well when they are cooked. These potatoes are best for frying and baking because their starch and high moisture content make them fluffy and absorbent. The starch content will also help to quickly thicken soups and stews. The starchy variety includes the Idaho or Russet. Waxy potatoes do not absorb much moisture, which makes them superb for soups and stews and allows them to hold their shape well when you want skin-on chunks of potato. They include New Potatoes, and Fingerling. Feel free to use whatever potato variety you have on hand or want to try out. My favorite is the red potato because it’s easy to cook leaving the skin on and the skin is thin so it blends into the soup well when pureeing. 1. Cook potatoes We are cooking this potato soup in a crockpot, but you could also cook this recipe on the stove top if you wanted. Start by roughly chopping red potatoes (or your favorite potato variety) and onions placing them into the bottom of your slow cooker. Kitchen Tip: To save time and keep nutrients, leave the skin on potatoes. You’ll be pureeing the soup at the end do the skins get chopped up. After you have the potatoes and onions in the crockpot you can pour in the broth. Set your slow cooker to cook on low for 8 hours or high for 4-6 hours. Kitchen Tip: If you want to add more protein to this potato soup recipe, consider adding a cup of diced ham, leftover chicken, or even stirring in some canned salmon at the end of the cooking time would be delicious. 2. Blend potatoes When the potatoes are cooked, reserve a cupful of cooked potatoes. This will give some texture to the soup. Using a potato masher or immersion blender, mash the potatoes. You could also carefully pour the hot soup into a blender and blend it, but be careful to avoid burning yourself. 3. Making the cream base Melt butter in the same saucepan. Stir in flour. Whisk in the milk until smooth. Cook and stir over medium-high heat until the base is slightly thickened and bubbly. Continue cooking and stirring for another minute. Add a cupful of the soup into the flour-butter mixture to slowly start the process of thickening. Gradually whisk the thicked mixture back into the crockpot of soup. Check out this article on How To Make A Roux if you’d like more instructions. How To Thicken Potato Soup without a Roux? 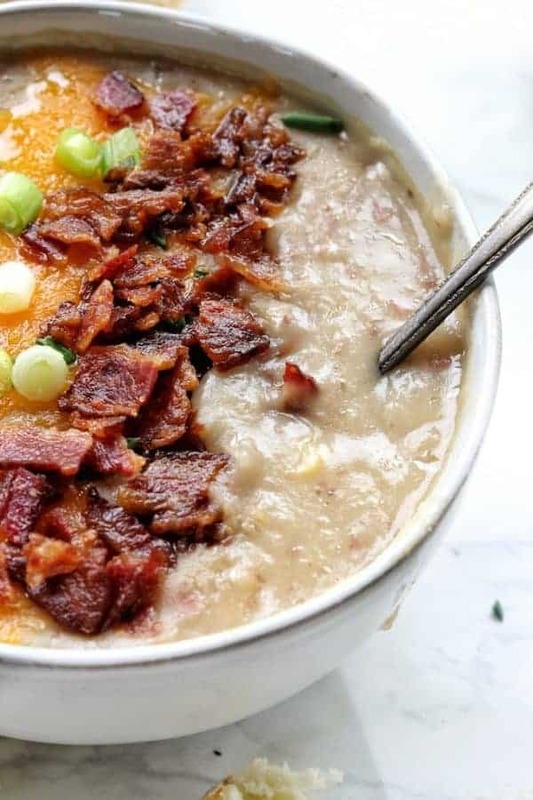 If you want to skip this step, or would like to skip adding the butter to your soup, you can thicken slow cooker potato soup to your liking by using instand mashed potato flakes. Pour in about 1/2 cup and stir. Keep adding flakes until you get your desired consistency. The flavor won’t be quite the same, but delicious none the less! 4. Finishing the soup Add back the reserved potato chunks and stir in the canned corn and soy sauce (or substitute salt). If a thinner soup is desired, stir in a little more milk. Add your favorite toppings such as bacon, shredded cheese, and green onions. What substitutions would you add to the list? It’s like a loaded baked potato in a bowl! Super warm, rich and creamy along with being really kid-friendly. This recipe makes plenty for additional meals or leftovers for lunch the next day. 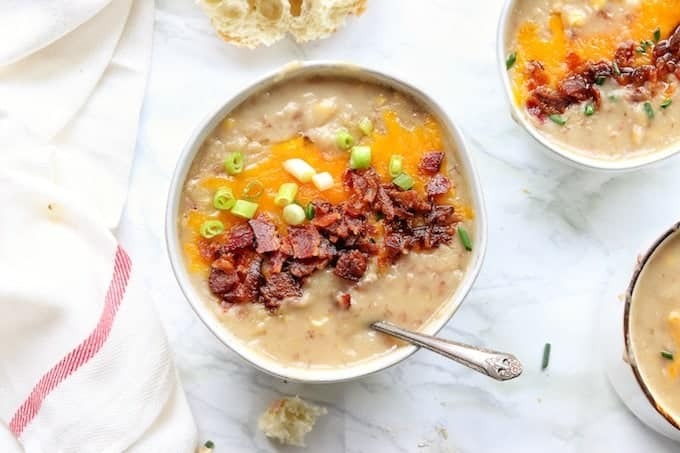 You can certainly freeze slow cooker potato soup. The soup will stay fresh in your freezer for about 4-6 months. You might find it seperates a bit before reheating, just give it a good stir and it will be like new. I like to freeze it in indiviual serving sized microwave safe containers so I can grab it for a simple lunch that all I need to is heat. How Long Does Potato Soup Last In The Refridgerator? For the best quality, use this soup within 3-4 days or freeze it for later. Check out these other budget friendly meals: Baked Chicken Thighs, Turkey Casserole, Baked Spaghetti, or Tater Tot Casserole. 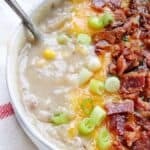 A cheap crockpot meal, this creamy potato soup is simple and quick to prepare and cooks all day in the slow cooker. Other Crockpot Meals that you should check out include Mexican Chicken Quinoa Casserole, Crockpot Chili, Crockpot Lasagna, and Crockpot Pasta. I’m ALL about the slow cooker. This will be in my pot soon. FB keeps reminding me through memories how tall my kids are growing too! Oh my gosh, some days it makes me so sad when FB reminds me my kids are no longer babies, Serena! Oh my gosh, I love soup! Especially this time of year. Mmmmm this recipe looks amazing! This looks so easy and delicious! I love a good soup, especially this time of year. I really need to pull out the crock pot, before spring. Crock pot soups are the easiest and the best way to stay warm. You could easily make this with veggie broth as well. This looks really good! I would have to say my favourite budget friendly meals would be orvernight oats or a stew/ chilli recipe in the crock pot!! Yum!! 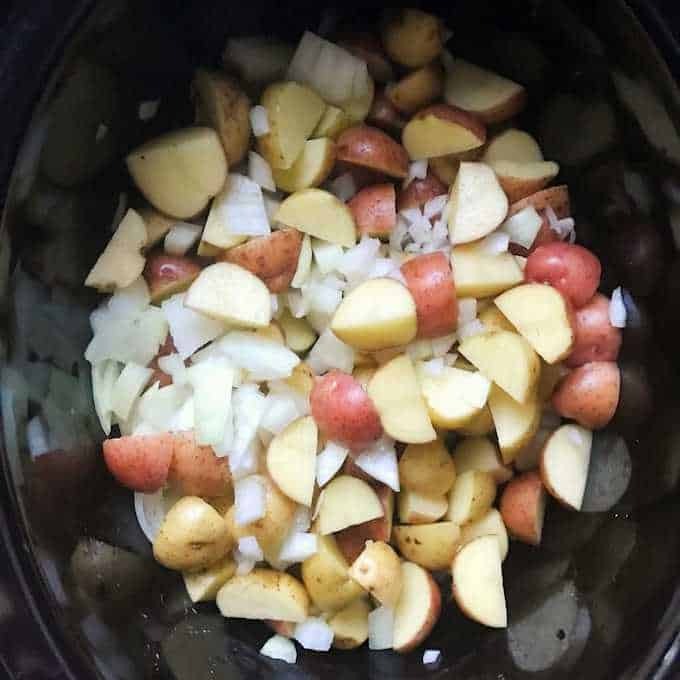 I love any recipe I can make in my crockpot and potato soup is one of our favorite recipes! I am with you Liz! Crockpots are the best ever! For me, mexican food tends to be super budget friendly! Beans, rice, corn, veggies & salsa are pretty darn cheap!! I couldn’t agree more Karri! I also turn to Mexican foods – price and flavor are both great! im loving all this budget friendly ideas this month! love this comforting soup. Me too, Dixya! I sometimes forget just how much money I spend on food. I am excited for all these wonderful, inexpensive, meals to try! I so love soup in winter. Potato soup is a great stable soup. I love that this is easy and inexpensive. Plus, you can freeze it for later meals! The simplicity was my favorite! And freezing leftovers = lifesaver on busy nights! This is so darn easy! I love a good potato soup, and it doesn’t get better than this 🙂 Maybe I’d add chickpeas for some additional protein. Gotta love a yummy crockpot recipe! Potato soup is one of our favorites. I would love to add some chives and sour cream like you recommend. I just made this tonight and it was absolutely delicious! I did notice something odd as I was making it though. Milk is listed in the ingredient list, but the recipe does not say where to use it. Is milk supposed to be used at some point? Such a simple soup that has so much flavor.